The first great anti-war film based on Erin Maria Remarque’s novel of the same name (1929). Remarque had experience first-hand as a German soldier during the war. The film was made on a budget of $1.25 million for Universal Pictures, under the leadership of Carl Laemmie, Jr., on acres of California’s open ranch lands with over 2,000 extras, and it was directed by Lewis Milestone. The story begins in a small German town as celebrated young soldiers head off to war. In the schoolhouse, a German professor explains to his students the heroism of the soldiers who go to fight and die for the homeland, Germany. All the boys rise in a fit, including Paul Baumer, to fight for the German army. Together they are put through a grueling boot camp before being marched to the front lines where they encounter the horrendous lack of food, clothing, shelter, and the continual bombing from the French army on the Western front. They are invaded by rats, are forced into trench warfare-hand to hand combat, and find themselves routinely driven to the point of sheer insanity waiting for the explosions to stop. At a moment of pause, while on temporary leave, they ask themselves how a war is started. Does a mountain in Germany get mad at a field in France? The boys have nothing against the Frenchmen personally. They bemoan the richness of the Kaiser and the manufacturers who get rich. Paul then goes to visit his wounded dying friend whose legs were severed off. The boots of the dying are passed to the boots of the living –one soldier to another. In the next battle, Paul gets trapped in a foxhole and stabs a Frenchman to death. The man slowly dies throughout the night and Paul apologizes to him. He rummages through the soldiers things to find a photograph of his two children and Paul weeps. Later Paul is hit with shrapnel, is sent to the hospital, and eventually goes home on leave only to find things are not the same. He returns to his old classroom to find his jingoistic professor still whipping up the child-like students into a rage of nationalism to fight for Germany. Paul contradicts the professor and explains the horrible brutality of war. He castigated as a coward. Paul has no place to go but back to the front. He returns only to find that two of his old comrades are still surviving, the rest are baby-faced young boys aged sixteen. While greeting one of his comrades they are both hit by a bomb and his comrade dies. Paul wanders aimlessly out to the trench and rests at the Gatling gun. During a moment of calm, he notices a small butterfly resting amidst the carnage. While reaching down to pick it up, a French sniper shoots and kills Paul before he can grab hold of the butterfly. 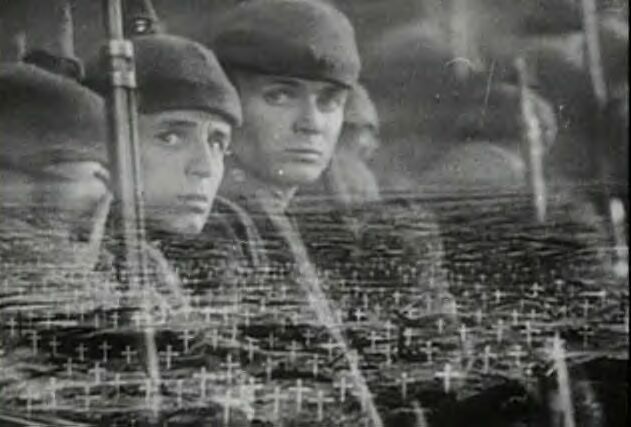 The film ends with scenes of the young troupe marching off to war –tired, scared, and helpless. 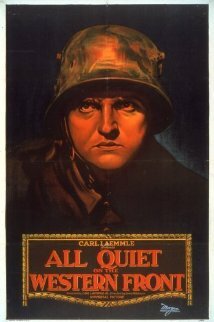 All Quiet on the Western Front is one of the greatest war films ever made. It is both harrowing and haunting in its graphic depictions of trench warfare and the madness of the ‘Great War’. A truly memorable film that should be viewed by all serious film lovers at least once.